Concerns about light pollution arose in the astronomical field as a consequence of its adverse effects on astronomical observations, at times so severe that it caused historical observatories, such as the Mount Wilson observatory in Los Angeles, to be shut down. In the last decade, however, there has been a proliferation of studies connecting the excess of nocturnal lighting to health hazards and damage to ecosystems which, compounded with the waste of energy, firmly establish the need to regulate nocturnal lighting. Now, a study led by the Institute of Astrophysics of Andalusia (IAA-CSIC) shows that the sensors most widely used to monitor light pollution around the world - the Sky Quality Meter (SQM) and the VIIRS and DMSP satellites – have a fundamental flaw when tracing the evolution of light pollution: they are “color-blind”. "Even though the pictures of nocturnal lighting we are used to seeing display color, the latter is an artistic interpretation of images originally in black and white - says Alejandro Sánchez, researcher at the Institute of Astrophysics of Andalusia in charge of the study. Thus, the recently published World Atlas of Light Pollution only represents the tip of the iceberg, as the authors themselves recognized in the article, since it was assessed using mainly that type of device." The study shows how the most popular sensor to trace the evolution of light pollution on Earth, the SQM, could yield equal values for two cities lit with sodium lamps and white, 300 Kelvin LEDs, respectively, when in reality there may be 100% more light pollution in the second case (Kelvins are the units used to measure the color temperature of LEDs). “This is very important because we are at a crucial moment: cities around the world are substituting LED devices for the traditional sodium lamps, yet we see how essential it is to know the color, lest we get the false impression that we are reducing light pollution when in fact we are doubling it”, says Alejandro Sánchez (IAA-CSIC). The study shows how white LED light pollution can be reduced to the level of traditional sodium lamps, but to do that their power must be cut by at least 58%, and there must be no illumination above the horizontal level. Following the conclusions of this study, ratified last week in a report issued by the US Department of Energy, the municipalities of Montreal and Quebec have decided to modify their public lighting plan, reducing the amount of new LEDs by two thirds, and committing not to use lighting with color temperatures above 2700 degrees Kelvin. "Light pollution is a serious problem that needs to become a part of the political agenda, not only because of its impact on our health or that of ecosystems, but because, in Spain alone, it represents a waste of between 655 and 1255 million euros each year ", says Sánchez (IAA-CSIC). Efficient systems to monitor the evolution of light pollution using new sensors are already in existence: the Universidad Complutense in Madrid designed a color sensitive sensor, and Unihedron, the maker of the SQM, is working on a solution to the problem. Pictures taken by astronauts aboard the International Space Station using reflex cameras may also turn out very useful; they have already been put to use in the project Cities at night (www.citiesatnight.org). Moreover, the use of new models of light pollution propagation that take these factors into account is fundamental to enhance adequate control measures. Another solution resides in the use of amber type LEDs or LEDs with color temperatures lower than 2200 K, which do not pose the problem of white LEDs. In 2016, the IAA-CSIC created the Center for Sky Quality in order to counsel institutions and protect observatories in Andalusia. In its first year of existence it has answered more than fifty inquiries and it monitors the sources of light pollution that affect its observatories using satellites. Picture of the city of Granada taken by astronauts aboard the International Space Station. The different installed LED lighting (white and blue) can be clearly distinguished from the sodium lamps (orange and yellow). 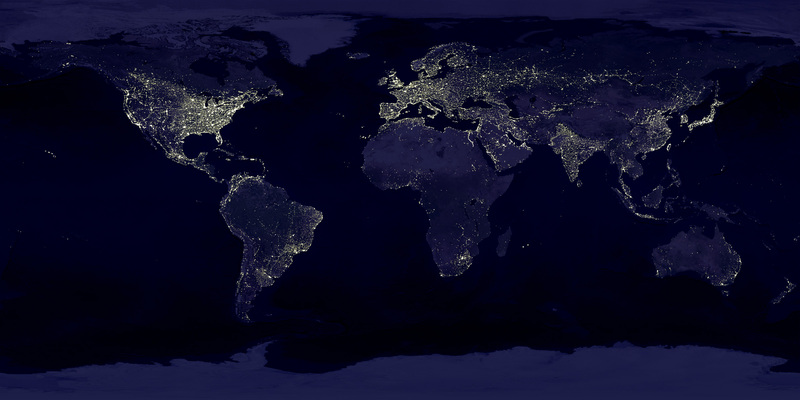 Source: Cities at Night/IAA/UCM/ESA/NASA 2015. Among other work carried out by the center is a study of the relation between the light detected by satellite and breast and prostate cancer, a new 3D modeling program of light pollution, remote sensing using stratospheric balloons, and a photography contest of light pollution in protected areas. The center also advises municipalities wishing to promote astronomical tourism and get certified for sky quality in their region. A large portion of those projects is carried out within the European Stars4all project.